The current state aid system in Poland provides for preferential treatment of investors who set up their business in the territory of one of the Special Economic Zones (SEZ), i.e. within a legally designated part of Polish territory. The SEZ benefits include, in particular, exemptions relative to corporate income tax for corporations or personal income tax for non-corporate entities. However, in recent years this system has failed to keep up with ever-changing socio-economic challenges. The zones have proved to be a rather inadequate instrument for sustainable development and the rules of support in Poland have become less attractive compared to those offered by foreign competitors. Noerr’s Budapest office has advised ErlingKlinger AG, a Frankfurt stock exchange listed innovative car part manufacturer, on its financing by a syndicate consisting of Commerzbank, Landesbank Baden-Wurttemberg, Deutsche Bank, DZ Bank, HSBC, and Banque Europeenne du Credit Mutuel. Noerr has advised Swedish web-hosting service provider Loopia Group AB on its acquisition of 100% of the shares in WebSupport s.r.o. from Trantor Ventures GmbH. Noerr has advised AEW Europe on the acquisition financing of the Luxus Aruhaz retail unit at Vorosmarty square in the heart of Budapest. The transaction was financed by UniCredit Bank AG Vienna, which was represented by Wolf Theiss. Noerr has advised the European Investment Bank on financing provided to the Hungarian automotive technology company Almotive. Noerr Budapest has advised Hiventures on its investment in Oriana International, a Hungarian company providing low-code platform development and partnering in domestic and international sales. Viktor Fuzi and Petr Hrncir have been promoted to Partner at Noerr in Budapest and Prague, respectively. Noerr has advised Landesbank Hessen-Thuringen Girozentrale on the refinancing of Atrium European Real Estate's acquisition of the Wars Sawa & Junior shopping center in Warsaw. Allen & Overy advised AERE on the deal. Binder Groesswang, Noerr, and Spain's Gomez-Acebo & Pombo have advised Japan's Daikin Group on the EUR 881 million acquisition of AHT Group from the Bridgepoint private equity group. The Frankfurt office of Freshfields Bruckhaus Deringer advised the sellers on the deal. Foreign sanctions are forcing international companies to carefully evaluate their contractual relationships with Russian counterparties. In this respect Russian competition law provides obstacles that may be difficult to over-come. RTPR Allen & Overy has advised Ruukki Romania, a member of the Swedish group SSAB, in relation to the sale of its factory in Bolintin-Deal, Romania, to Finland's Peikko Group Corporation. Noerr advised the buyer on the deal. Noerr has advised Work Service S.A. on the PLN 155.3 million sale of all its shares in Exact Systems’ companies in a management buy-out by Pawel Gos and Leslaw Walaszczyk, founders and managers of Exact Systems, supported by funds managed by CVI Dom Maklerski through Remango Investments. Crido Legal advised the managers and Gessel law advised CVI Dom Maklerski. Below we highlight key developments and challenges related to the new Russian law on syndicated facilities. 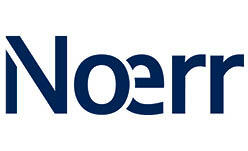 As one of the top European law firms, Noerr is also well established internationally with offices in eleven countries and a global network of top-ranked “best friends” law firms. In addition, Noerr is the exclusive member firm in Germany for Lex Mundi, the world’s leading network of independent law firms with in-depth experience in 100+ countries worldwide.